When you leave a landlocked state like Colorado and head to the coast, you want to spend your time along the water. Not a creek, not a lake, not a reservoir, but the water. (It's in italics because it's such a big deal!) A really affordable way to get on the water in Seattle is to take a ferry. A one hour tourist harbor cruise was about $25. A round-trip ferry ride to Bainbridge Island was $7.50. 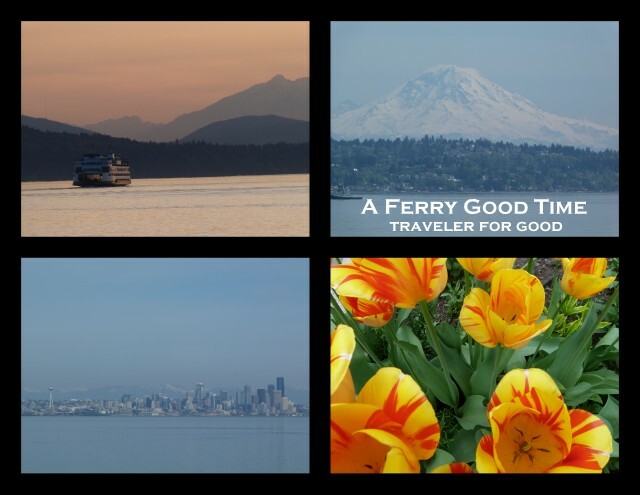 Ferries are a combination of people commuting and people on vacation - and it's a true Washington state experience. We had a beautiful sunny day for our ferry ride. We could see Mount Rainier in the distance and enjoy the Seattle skyline in the not-so-distance. Bainbridge Island has shops and cafes within walking distance of the ferry terminal. We didn't have much time on the island, but I did get to have ice cream (Mora Iced Creamery), so I was happy as could be. To see where the Washington State Ferries can take you, click here.